M. L. West (ed.) Homeric Hymns, Homeric Apocrypha, Lives of Homer, Loeb Classical Library 496, 2003 (cloth in dustjacket), $12. SOLD! Eleanor Dickey, Ancient Greek Scholarship: A Guide to Finding, Reading, and Understanding Scholia, Commentaries, Lexica, and Grammatical Treatises, from Their Beginnings to the Byzantine Period, Oxford University Press/American Philological Association, 2007 (paperback), $15. SOLD! Peter Garnsey and Richard Saller, The Early Principate: Augustus to Trajan, Greece & Rome New Surveys in the Classics No. 15, Oxford University Press, 1928 (paperback), $10. 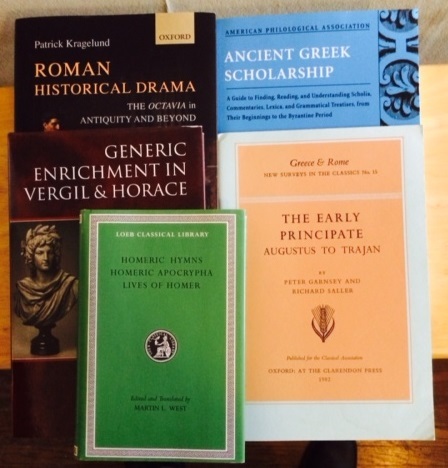 I also have a couple of duplicate Plato books, but a college friend has ‘first dibs’ on those. I will add them here if he turns them down.